"Drink to thy new Master! Drink to damnation of old Sir Ensor! Drink to my bride—warm wine for my bride of ice!" R.D. 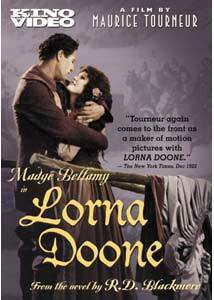 Blackmore's historical romance Lorna Doone has been frequent fodder for film adaptation, with numerous sound and silent versions to its credit. This adaptation helmed by Maurice Tourneur is generally regarded as the best of them all, and it more than lives up to its reputation. The only serious issue is the somewhat overwrought style of the actress in the title role, which induces giggles when it shouldn't. In 17th-century England, the Doone clan are a threat to safety and property. Led by former nobleman Sir Ensor Doone (Frank Kennan), the extended family loots, pillages and rapes at will across the English countryside. Young Lorna (May Giracci) is seized from her mother (Irene De Voss) and raised as Sir Ensor's own daughter, to the unhappiness of both mother and little Lorna's young boyfriend, John Ridd (Charles Hatton). Some years later, Lorna has grown up (Madge Bellamy), and when John (now John Bowers) finds her, there is immediately conflict with Carver Doone (Donald MacDonald), who both covets Sir Ensor's spot at the head of the clan and Lorna for his own. Where Tourneur's The Blue Bird was completely stage-bound, here he has the freedom of location shooting and an expansive feel that brings the English country to life. That feeling of immediacy is emphasized by the superbly-staged action sequences, such as the vivid raid on the stagecoach when Lorna is captured, to the frenzied assault on the Doone fortress. Few silent films of the early 1920s outside of the Fairbanks canon yield such nicely-rendered action that stands up as quite so thrilling today. There's also some decent melodrama as the romance twists and turns through the running time. Lorna and Ridd have a particularly moving scene of parting about two-thirds of the way through. Where the film is handicapped is in its star, Madge Bellamy. Although charming and cute as a button, she's ferociously histrionic throughout. When people make fun of silent acting as exaggerated to the point of silliness, Madge Bellamy is Exhibit A in support of that stereotype. It doesn't help at all that she's surrounded by a cast that mostly plays things straight and naturalistic; even little May Giracci turns in a fine performance as young Lorna, making Bellamy a particularly sore thumb. The only other cast member who turns to such bravura overacting is Frank Keenan during his rather ridiculous deathbed sequence, as he stares gauntly ahead while rising to defend Lorna's honor from Carver's depredations. John Bowers is serviceable as the male lead, though not terribly impressive in either a good or bad way. Donald MacDonald's Carver Boone is a vivid rendition of a sociopath with few redeeming qualities, but at least he's not over the top. As in most things English, class is a concern right in the forefront. Lorna is virtuous primarily because she is from the nobility, and Sir Ensor in his own way is also, having been driven to outlawry by injustice (the keepcase claims the movie is set during the English civil war of the 1640s , but that doesn't jive with the depicted baptism of James the Old Pretender, which didn't happen until 1688). But Carver, low-born, is a thorough rotter. The one exception to the rule is John Ridd, who is low-born but rendered virtuous through his love for noble-born Lorna. Class makes for some interesting comic drama later on in the film, as King James II first lauds Ridd for preventing an assassination, then rejects him as a clown because he plays with the infant prince. It's hard to tell whether the producers are being critical of the class system or are embracing it wholeheartedly. The photography is quite attractive, with plenty of visual interest throughout. For the most part, the intertitles are original decorative titles from the original release, though a few have apparently been replaced with plain video-generated titles due to damage or deterioration. Image Transfer Review: The original full-frame picture is slightly windowboxed to preserve as much of the frame from overscan as possible. There are a few spots with serious wear and others with significant damage (mostly in the form of scratches, though the occasional small tear shows up too). It's quite nicely realized, though the heavy grain has a mild sparkle effect to it. The tints are from the original nitrate print held by the George Eastman House. Greyscale and detail are very good. Audio Transfer Review: Japanese composer Mari Iijima contributes an instrumental score to the film, primarily using a small string section, with an occasional bit of piano. About half a dozen different themes are used, and they're used appropriately but a little more variation would have been nice; they sound a bit repetitive as you hear them through the running time. There's no problem with the recording, which is crisp, with the string pulse coming across very nicely. Extras Review: There are a handful of extras here. A still gallery of a dozen images is supplemented by a shot of the dust jacket of the "Madge Bellamy edition" of the novel, released as a tie-in. A bio and complete filmography are provided for Tourneur. The last item is a transcription of the review from the December 4, 1922 New York Times. It's quite laudatory and it's interesting to see what elements were most striking to a 1922 critic. A beautiful and frequently thrilling romantic adventure. Despite some wear, it's a good transfer but the extras are rather sparse.